John recently talked to us about how he and his wife Maisha decided to go solar. They live in Indian Land, SC. It started when he was in college in Miami, FL. He recalls around 2003-2008 he became aware his family’s house in the Florida Keys was below sea level. The worst hurricanes on record hit 2004-2005, meanwhile gas prices reached all-time highs. John says he suddenly knew then something needed to be done to reduce our dependence on fossil fuels and improve our environment. He began by starting a club called FIU Emerging Green Builders and was able to get a solar system donated for the group’s sustainable home project that won the Solar Decathlon in 2005 on the Washington D.C. National Mall. That kick-started his love of solar, which led both to career opportunities and to a project for his own home. In 2015, John and his wife were starting a family and decided they needed more room! 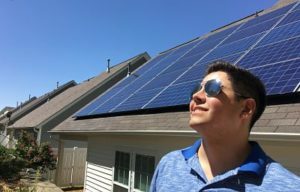 Putting his solar expertise to the test, John picked out a house with a southern exposure on the back in a neighborhood with a homeowners association (HOA.) At first the HOA told them no, but after educating the board with information from utilities, states and solar proponents, the board reversed its decision and John was able to sign a solar contract. John believes that it’s because he was the first solar system installed in his neighborhood that it took his utility two months to approve his solar installation, and notes that now nowadays the process is much faster. His installation was completed in a single day, and right away he had a lot of pride – and even put a lawn sign which he remembers prompted some neighbors to ask about it and ultimately also install solar at their home. The most exciting part? 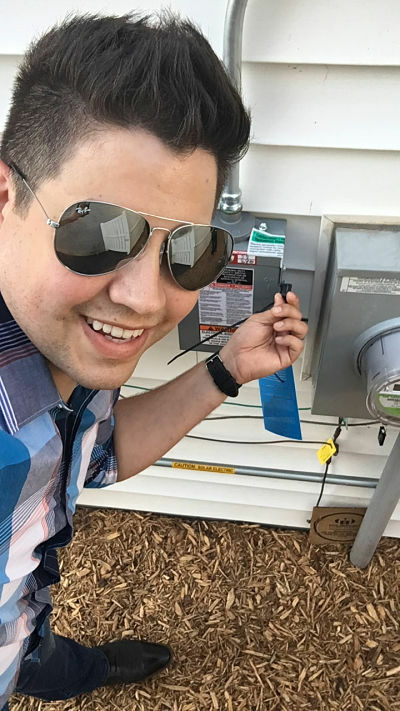 Taking a selfie while switching his solar system on. Solar technology has been around for over 40 years, and today it’s wonderfully affordable. John says the that old adages apply: good things come to those who wait, if it takes a while then it must be worth it, better late than never. Installations have got tighter and cleaner, and can be executed quickly – plus installers now offer product warranties and risk-free production guarantees. John says he thinks that’s why solar’s becoming mainstream. There’s still a lot that goes into a home solar project behind the scenes with permitting, paperwork, inspections and installation, but even those processes are getting so standardized – such that John’s rightly notes that the timeline from signing a contract to turning on a system can be as fast as a month. Credit saved up during the day provides savings on night-time use for the Sheldons (and the actual surplus energy from daylight hours goes out to the grid to serve their neighbors.) During those times their home’s carbon footprint is zero – which is gratifying knowing they’re “doing their part, doing the right thing”. What’s behind that peace of mind? John says it’s little things, like not worrying about the AC being on, or an LED light left on, or an appliance plugged in. When using his corded leaf blower, he’s more than willing to go ahead and do his neighbor’s yard too while he’s at it! Check out other Renu Energy Solutions customer success stories.